Trampolines are a wonderful way for children to get some exercise, develop gross motor control skills, spend some time outdoors, and burn off all that energy. But they need to be set up properly and used according to the directions, otherwise accidents can and do occur. Possible injuries that can be caused by trampolines include cuts, bruises, pinches, sprains and strains, broken bones and fractures, head injuries including concussions, and even death. The Consumer Product Safety Commission’s (CPSC) National Electronic Injury Surveillance System (NEISS) estimates that there were more than 72,000 reported cases of injuries to children under the age of 18 caused by trampolines that were treated in hospital in the United States in 2013. The number of actual injuries caused by trampolines is likely to be quite higher than this, as the data from the CPSC reporting system only looked at those injuries which resulted in medical treatment at one of 100 participating hospitals, and minor injuries were likely treated at home or another medical treatment facility not included in the reporting data. The American Academy of Pediatrics does not recommend home use of trampolines, but rather only in accredited training facilities. If you do decide to purchase a trampoline for your home, there are some safety tips to keep in mind. Always be sure to follow the manufacturer’s instructions for use, including proper staking and maximum weight and child limits. Whenever possible, limit jumpers to one at a time in order to prevent injuries and do not allow children to somersault on a trampoline as this is one of the leading causes of serious injuries. Proper adult supervision is essential. Whenever possible, look for certification by a safety authority such as the ASTM, GS, TUV, EN71, CE and be sure to inspect your trampoline regularly for wear and maintain appropriately. 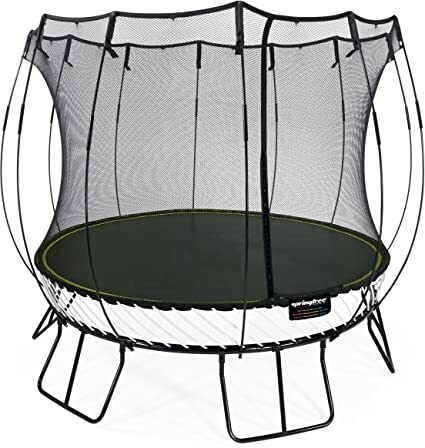 With the above information in mind, in no particular order, here are 50 of the trampolines we consider to be the safest, based on available features and average customer reviews and ratings. This trampoline comes with a fully enclosed safety netting to help keep your little one safe and secure while they enjoy some bouncing fun. Unique design helps to prevent frame twisting. 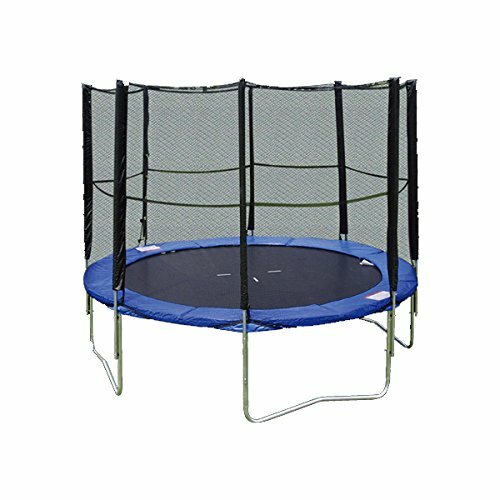 Available in a choice of several colors to match your child’s personality, this 15-foot round trampoline comes with reinforced T-sockets to help stabilize the upper enclosure and also prevents twisting of the frame while in use. 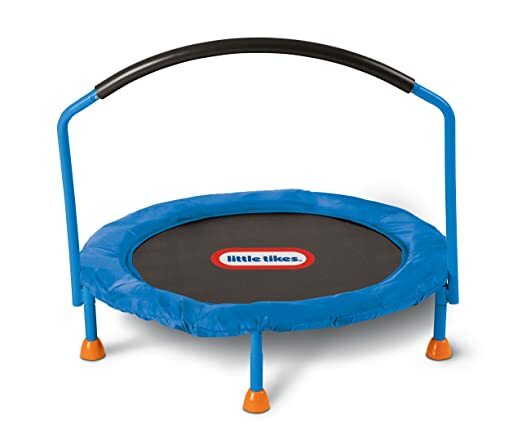 This non-folding 40-inch wide trampoline is ideal for indoor use and comes complete with a skirted jump mat to help prevent fingers and toes from being pinched in the coils. 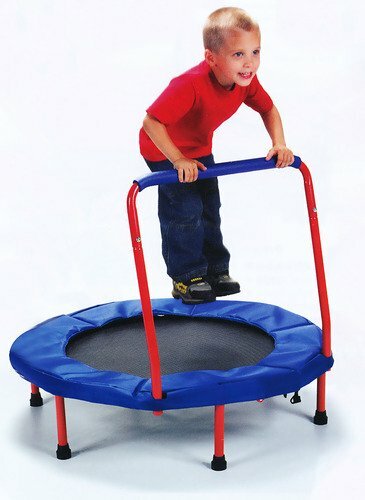 This fold-and-go trampoline is the perfect size for little jumpers and is suitable for indoor and outdoor use. Folds down easily for storage when the fun is over or to take with you when traveling. 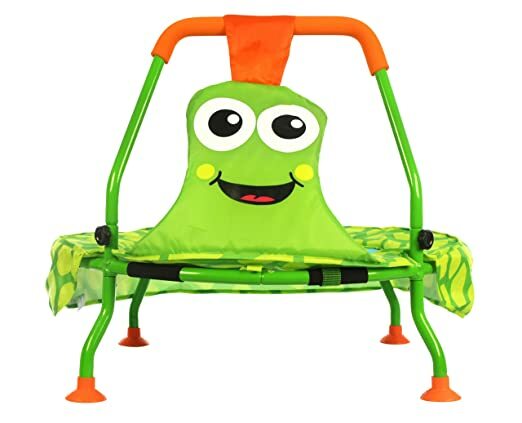 This little bouncer is available in a choice of three groovy designs that are sure to please you little one and features a handle with adjustable height selections to grow with your child. 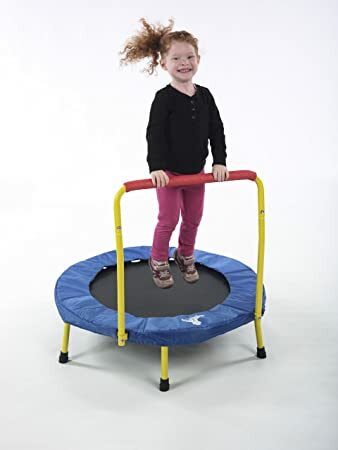 Another trampoline that’s suitable for both indoor and outdoor use, this model features an easy setup that can have your child bouncing in under five minutes. 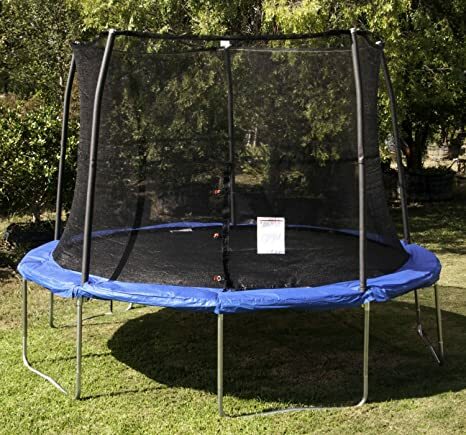 This rectangular-shaped trampoline features a fully enclosed safety net that is also UV protection for added security and safety. This model is perfect for the budding gymnast or competitive jumper thanks to its long straight sides. 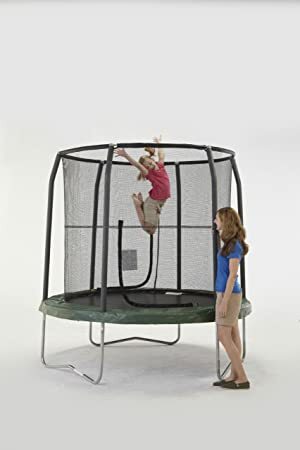 This trampoline is perfect for both indoor and outdoor use and includes everything you need to get set up quickly with your child’s safety top of mind. Secure straps help to keep the pad in place while gap spacers completely cover poles. This all-in-one set will provide your child with hours of jumping fun thanks to a heavy duty galvanized steel frame that is rust-resistant and suitable for outdoor use. 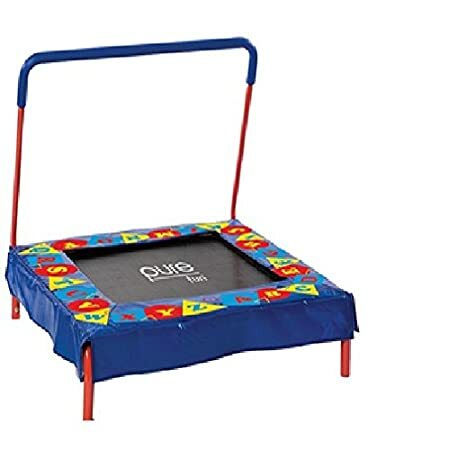 This jumper is available in a choice of two sizes to best suit your family’s jumping and bouncing needs and features a galvanized steel frame and UV-protected mat to provide long lasting outdoor usage. 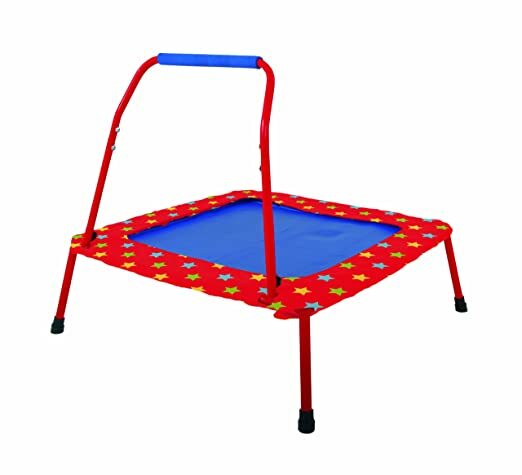 This nursery trampoline is the perfect indoor bouncing spot for little ones and features a padded handle for added stability and safety. 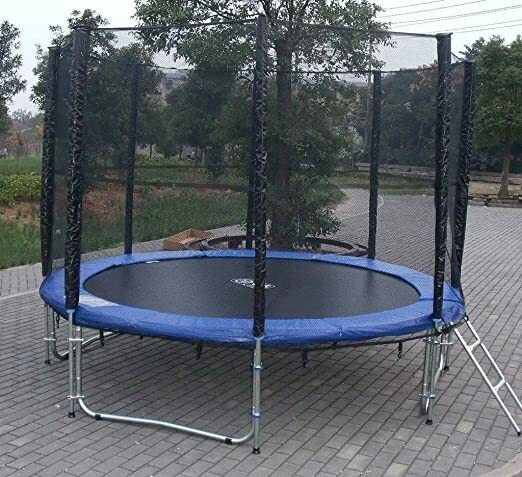 This circular trampoline features a fully enclosed safety netting for added security and features eight padded poles around the frame to provide a high level of stability. 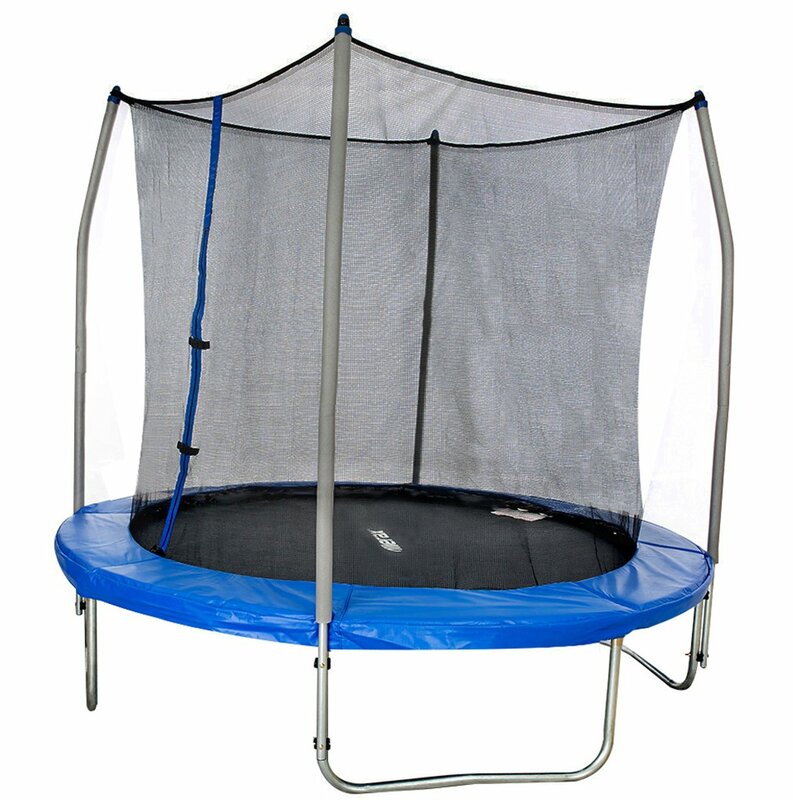 Thanks to its sturdy galvanized steel frame, this unit will provide hours of safe jumping fun. A fully enclosed safety net connects tight to the mat, leaving no space for fingers of toes to get pinched. 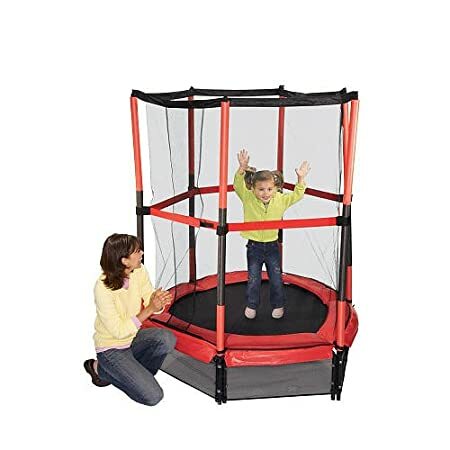 This pint-sized trampoline is fully enclosed to help keep little ones safe and features a handy built-in shoe storage pocket on the outside of the unit. Easy to assemble, this unit will provide kids with hours of active outdoor play. 16. 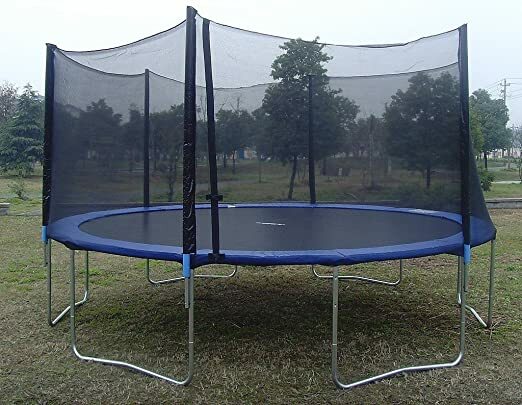 My First Trampoline Combo 55in. 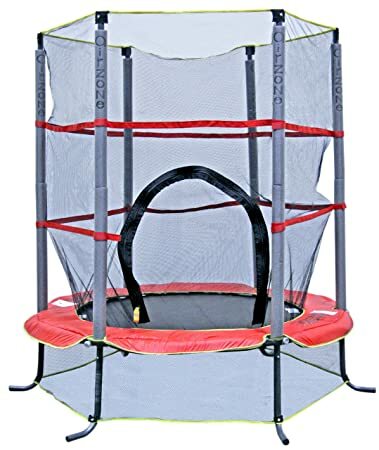 This all-in-one trampoline combo is the perfect first bouncer for little jumpers and features a fully enclosed safety net and mat made from grade A material. This unit is only for use indoors. This all-in-one outdoor trampoline combo set comes complete with a fully-enclosed safety netting and ladder for quick and easy setup. This unit meets all ASTM, TUV, and GS quality and safety requirements. 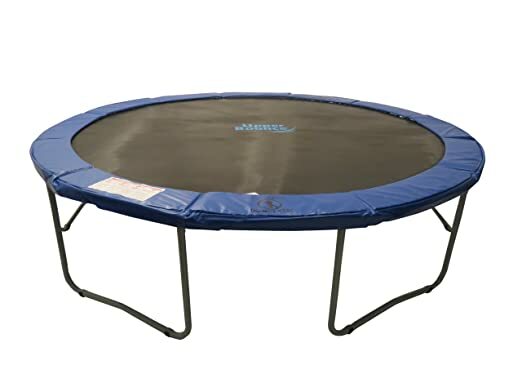 Perfect for your budding gymnast or competitive jumper, this rectangular-shaped trampoline features long sides and a galvanized interlocking steel frame for high quality support. 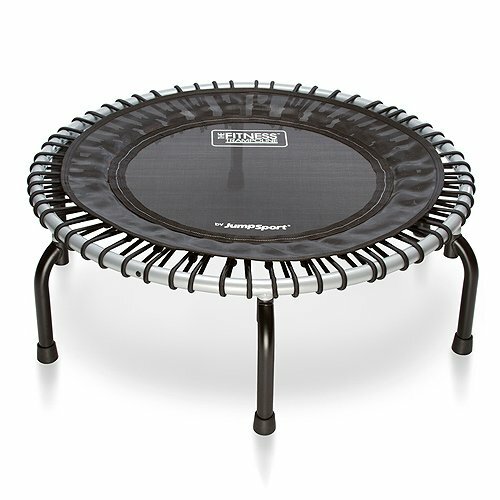 Ideal for indoor fitness use, this trampoline folds quickly and easily for convenient storage when not in use. 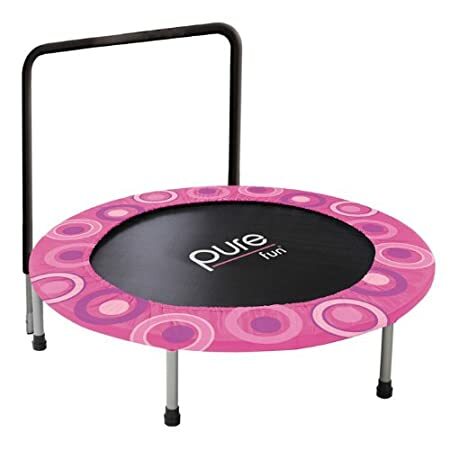 A steel frame and heavy duty rebounding surface provide a safe and secure bouncing experience. 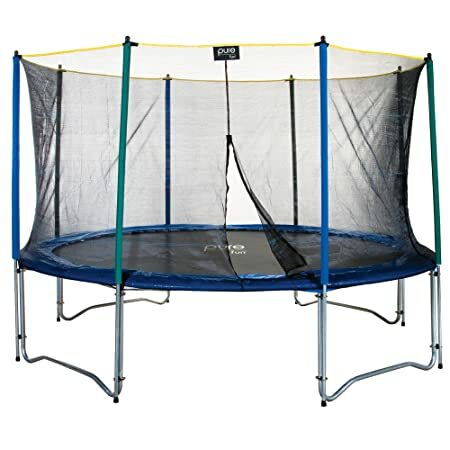 This indoor trampoline is perfect for those looking to get fit in the comfort of their home and features a unique design that allows the unit to fold in half for convenient storage when not in use. 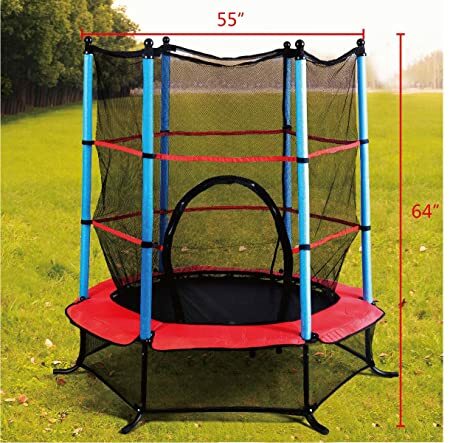 An ideal first outdoor bouncer for little ones, this trampoline has a patented zipper enclosure to keep them safe and padded support poles for further safety. 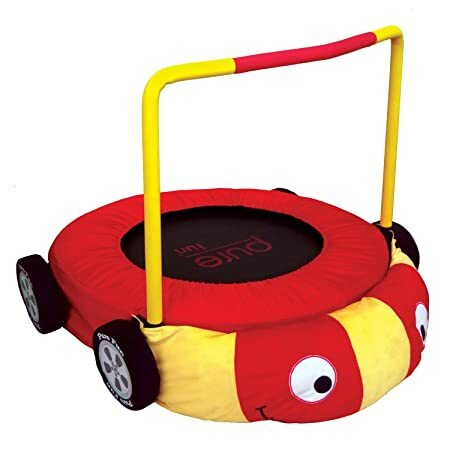 Perfect for the little race fan in your life, this car-themed trampoline features a soft and cuddly car face on the front of the unit that easily detaches for use as a pillow. Thanks to its patented T-Section design, this unit provides extra stability that prevents shifting during use. It’s easy to assemble without any tools and provides a deep bounce thanks to high performance steel springs. This fully enclosed trampoline features a patented Triple-Fail-SafeTM Enclosure System to help keep little ones safe while jumping. Its heavy duty frame is made from pre-galvanized steel for added security and durability. 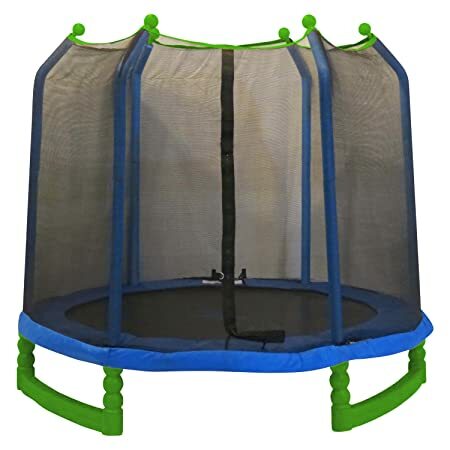 This trampoline features a large jumping area with a padded cover over the durable steel frame for extra safety and an adjustable bar that can grow with your child for years of use. 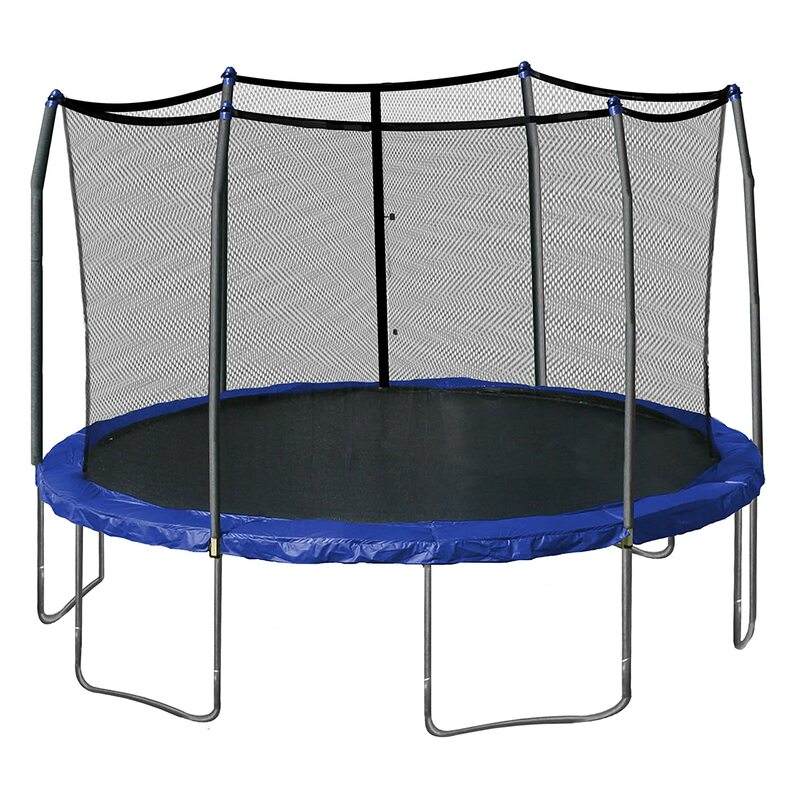 A cute, fun-shaped unit, this trampoline is ideal for younger jumpers and is suitable for both indoor and outdoor use. Two handles allow your little one to hold on like a bike while learning how to safely bounce. 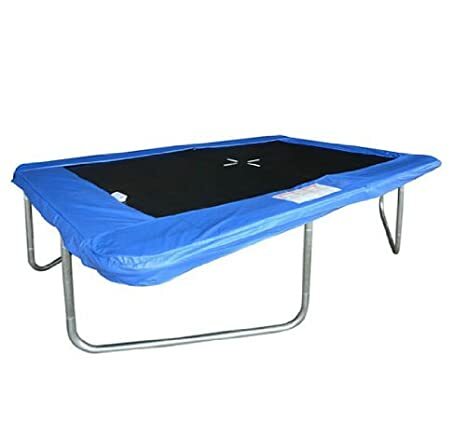 Ideal for use both indoors and outdoors, this trampoline model features a high quality safety pad with skirt and leg padding all around the unit for the ultimate in safety. Tools and hardware are included to make setup a breeze. 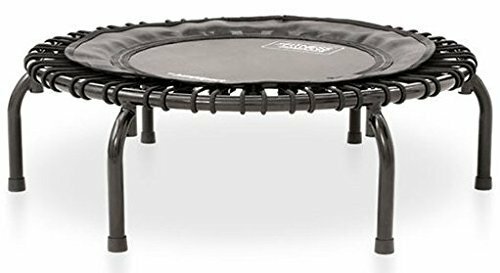 This round trampoline is constructed from a durable stainless iron steel that is rust-resistant for years of enjoyable use. Thanks to its unique design it won’t shift during use and requires no tools to assemble. 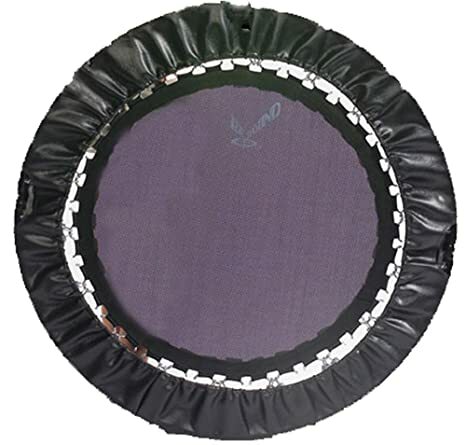 Thanks to its heavy duty premium polypropylene mesh construction, this trampoline boasts eight row stitching to provide added stability in preventing the mat from tearing. Its durable, rust-resistant steel frame is built to last. 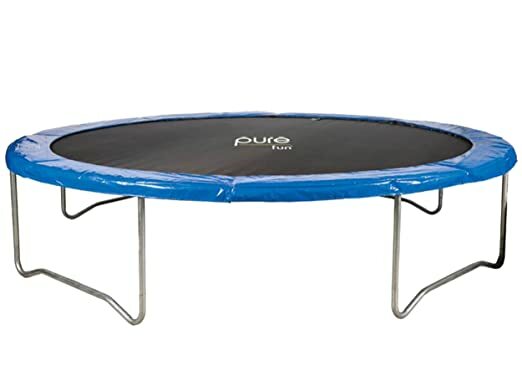 Perfect for the littlest jumpers, this trampoline is suitable for indoor use and features a sturdy steel construction to provide your child with hours of bouncing fun. 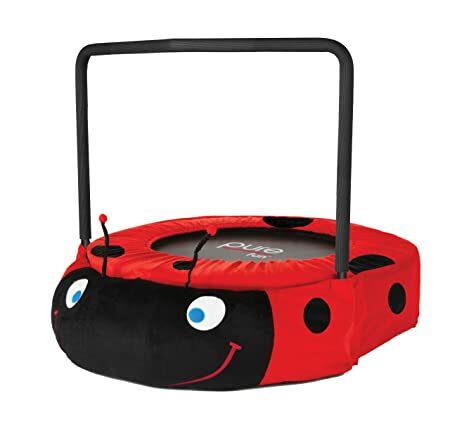 Perfect for the little jumper in your life, this ladybug-inspired trampoline features a soft and cuddly ladybug face on the front of the unit that easily detaches for use as a pillow. 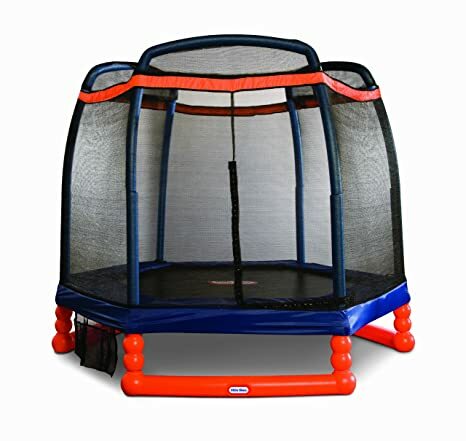 This trampoline features a fully enclosed UV-protective safety netting and galvanized iron steel tubing for lots of use. Plus with a two year manufacturer’s warranty,you can have peace of mind that they stand behind their product. 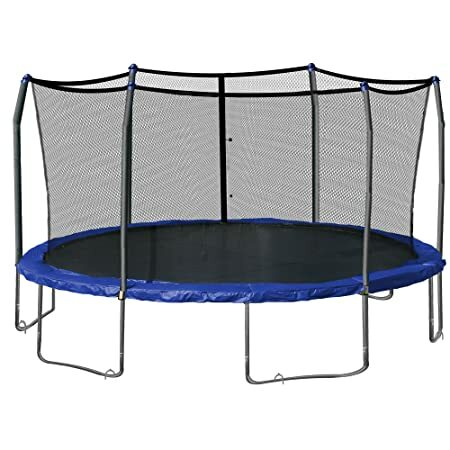 Available in a choice of three different sizes to suit your family’s jumping needs, this trampoline features a rust-resistant durable galvanized steel frame that’s easy to assemble. 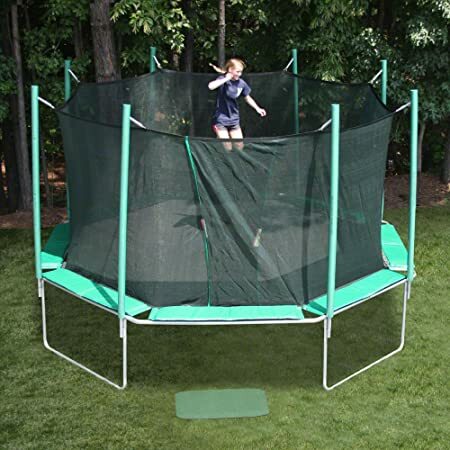 With a fully enclosed mesh safety netting, you can have peace of mind your child is secure while jumping. 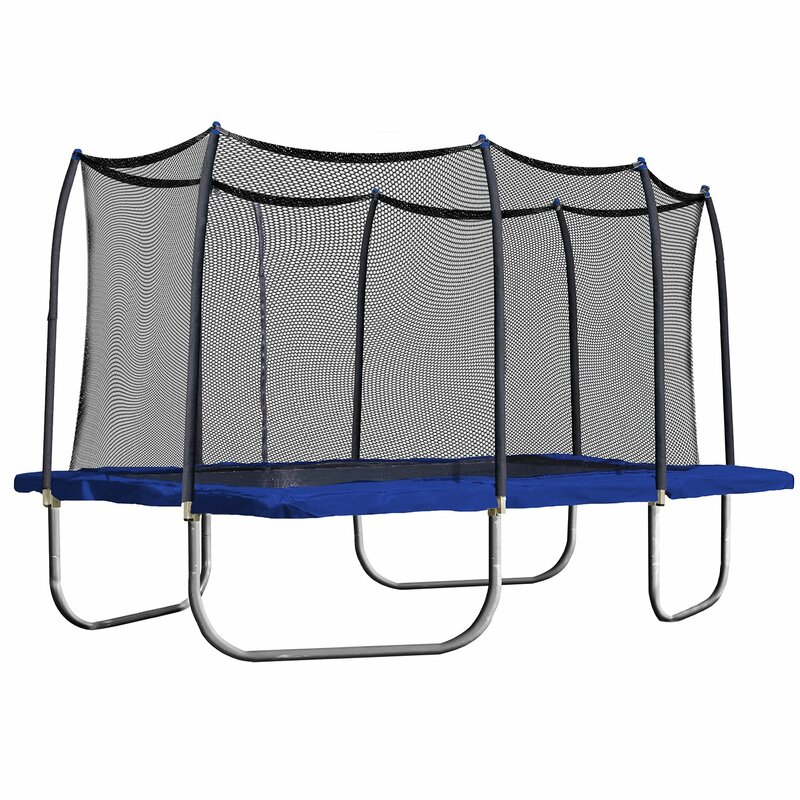 Durable galvanized steel construction can even accommodate teenage jumpers. This octagonal-shaped trampoline features an integrated safety cage that’s designed to provide years of safe and maintenance-free outdoor use for your family. Thanks to its unique design, there are never any openings between the cage and the mat to pinch fingers or toes. 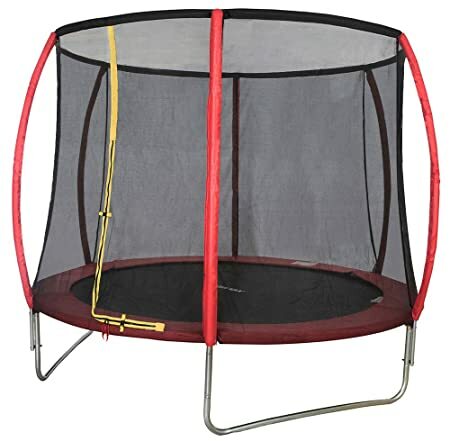 This smaller trampoline is perfect for young jumpers and ideal for both indoor and outdoor use. It easily folds for convenient storage when not in use and has been rigorously tested to meet safety standards. 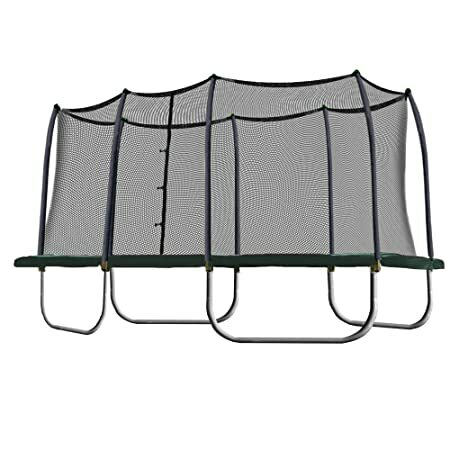 Thanks to its easy-to-assemble frame, your little ones can get jumping in no time on this trampoline. 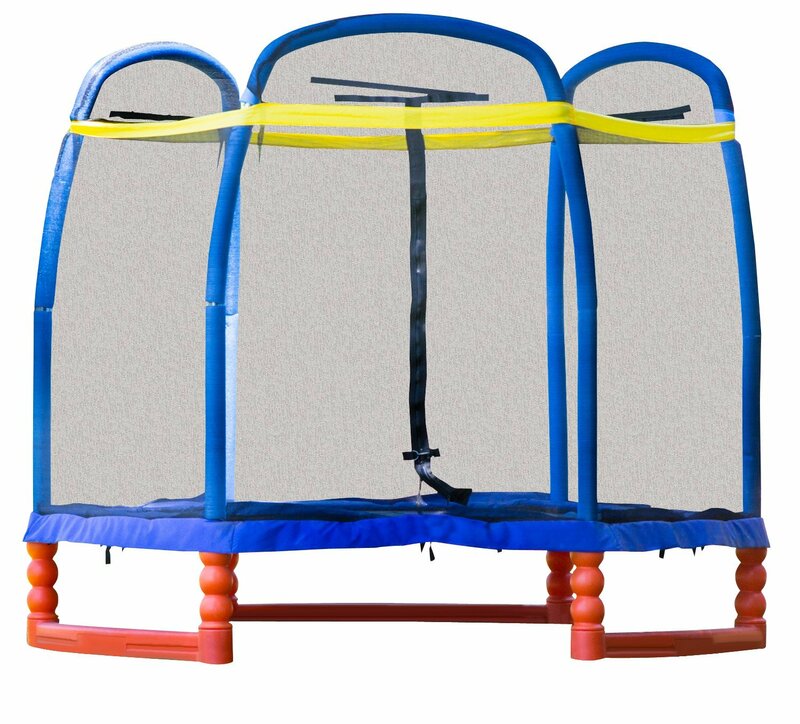 Fully enclosed safety netting provides peace of mind your child is secure while bouncing. 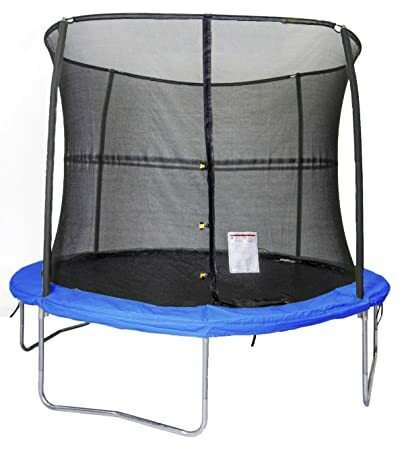 This trampoline comes complete with a fully enclosed safety net and features a unique easy-to-assemble top rail system that provides added stability and security. Thanks to its patented T-Section design, this unit provides extra stability that prevents shifting during use. W-shaped legs provide added stability while still offering a deep bounce thanks to high performance steel springs. 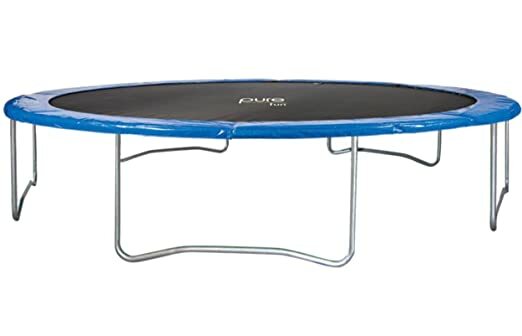 Suitable for use by both children and adults, this trampoline features a durable PP jumping material and rust-resistant galvanized steel frame that doesn’t require any special tools to set up. This trampoline touts itself as the world’s safest thanks to its patented rod-based jumping system that contains absolutely no springs to pinch fingers or toes in and durable double powder coated galvanized steel frame. 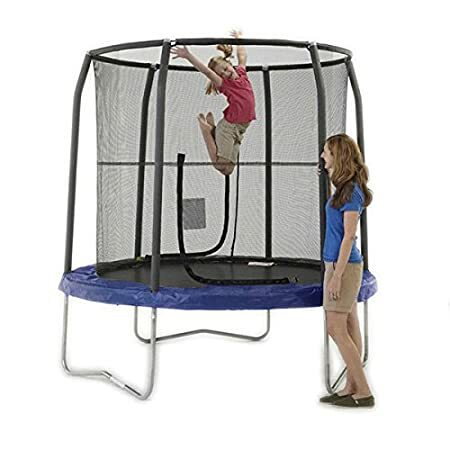 This all-in-one trampoline combo set features a fully enclosed safety net to keep little jumpers safe and a galvanized steel tubing frame that’s rust-resistant and designed to last. Included straps and ropes secure net to trampoline. 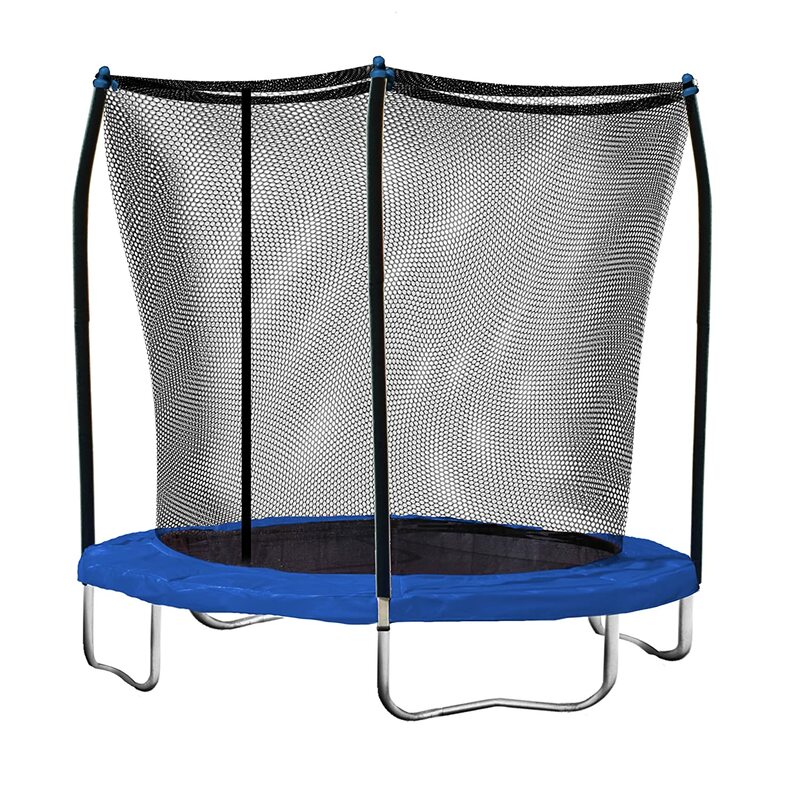 This circular trampoline comes with a fully enclosed safety net and features a galvanized steel frame that’s rust resistant and designed to stand up to outdoor wear and tear. 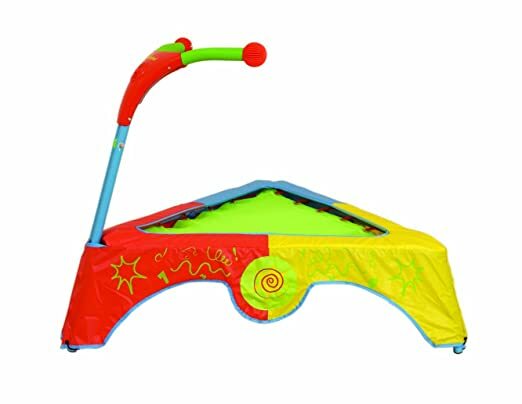 Its unique toprail system is easy to set up so your child can start bouncing in no time. 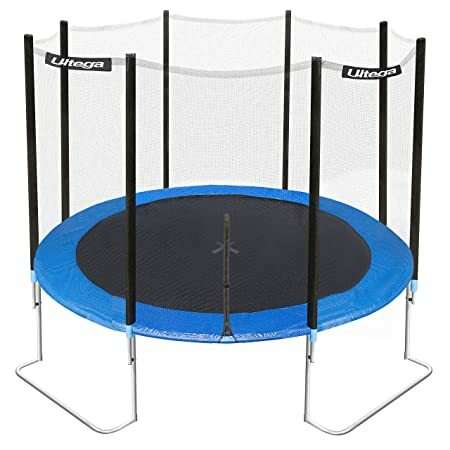 This trampoline (safety netting not included) features an easy-to-set-up design that requires no complicated tools or hardware and is made from a premium heavy duty polypropylene mesh that prevents ripping for added security while jumping. 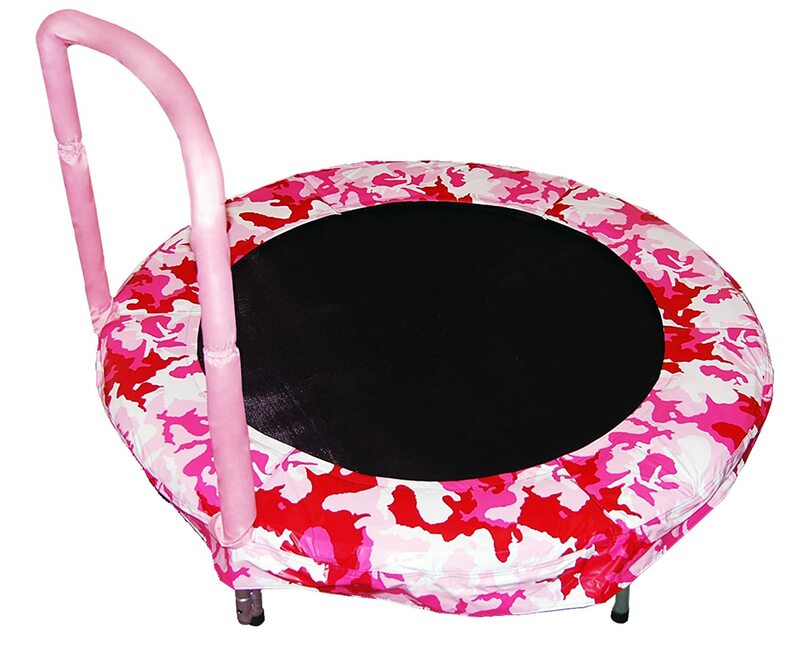 This super cute nursery trampoline is a sweet way to start your little one off practicing their jumping skills and features a padded cover and easy-grip handle that’s perfect for little hands to grip. This trampoline features an out-of-this-world space ship design that’s sure to impress little jumpers and is the perfect starter trampoline for outdoor use. 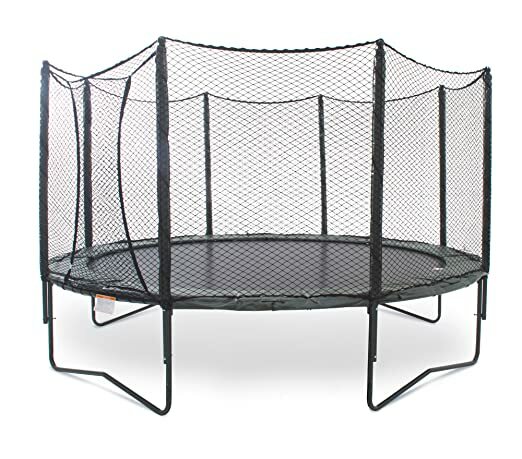 This rectangular-shaped trampoline is ideal for both competitive jumpers and hobbyists alike, and boasts a sturdy galvanized steel frame that is rust resistant – making it ideal for outdoor use. 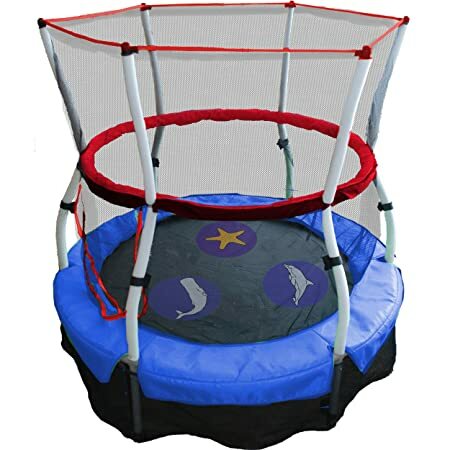 Send the kids on an underwater jumping adventure with this cute seaside-themed trampoline that features a padded enclosure along with a handle around the entire unit to provide a little extra support to new jumpers. 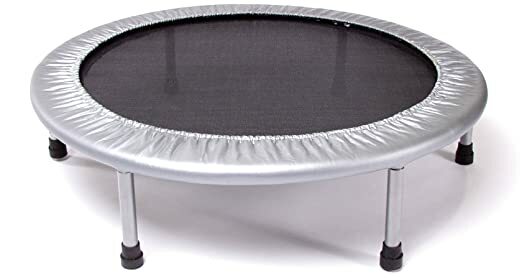 Perfect for both little and big kids alike, this trampoline features a highly durable galvanized steel frame that is rust resistant for outdoor use. Children will also stay safer thanks to its UV-resistant fully enclosed safety netting. This cool-looking trampoline features a unique arched zippered entryway and padded protective frame to help keep your little jumper safe. The unit collapses for convenient storage when the fun is over.